A few weeks ago my friend delivered something like a 20-minute monologue on how great Ray Donovan is. Have you seen the show? According to her, it was one of the best shows on television (which is a big compliment considering how great TV is these days), and that Liev Schreiber may be the title character, but it's Jon Voight (who plays Schreiber's dad) who steals the show. To put it in her words, "He plays such a hateful character, with practically no redemption, but I can't get enough of him." Well, I thought, this I gotta see. So after maneuvering my TV schedule (yes, this is now a chore for me these days), I finally sat down to watch a full episode of the Showtime series, and I was immediately hooked. So much so that I binge watched the full first season in its entirety in just a few days. In this age of the antihero, it's nice to see a character who's just a plain ole villain (a word that's become almost obsolete these days). Yes, villains can still be complex characters and, in the right actor's hands, they can be compelling to watch. 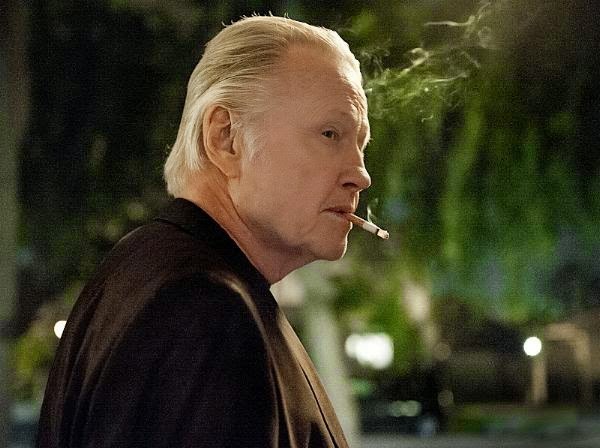 That's what Voight's Mickey Donovan is--on paper, just the father of a brooding Hollywood-based fixer whose job it is to "fix" the tarnished images of celebrity stars (with his own brand of illegal persuasion) but learns that task is nothing compared to the drama he faces within his own family. Mickey is somewhat of a gangster, having rebound closer to his son in the Hollywood Hills. A true Boston villain who continues to bear the cross of having served time in prison for crimes he says were committed by his son and his crew--a fact he conveniently whips out whenever his son tries to give him the cold shoulder (which is all the time). But Mickey doesn't consider himself a victim. No, sirree. If anything, spending time in jail boosted his street cred and made him that much more unbearable to be around--even if all he's doing is just hanging around with his cronies and minding his business. Though he wallows in his own a**holery, sometimes spewing racist remarks that only emphasize his repulsive nature, he has a weakness for African-American women--in particular, Claudette (played by Sheryl Lee Ralph). When we first meet them, we learn that their love story (so to speak) has long since been over and Claudette has moved on (much to Mickey's chagrin). So Mickey compensates by finding casual romance with similar women, and one fateful blonde (played by Rosanna Arquette), who learns too late the repercussions of hanging around someone like Mickey. As detestable as Mickey is, he's also an aging man who's desperately trying to hold on to his threatening image, while grappling with the realization that the family he abandoned so long ago refuses to welcome him back in their lives (at least not without a cost). Mickey is like an older, slightly more domesticated version of Jack Nicholson's character in The Departed. Vile yet predictable, old yet quick. But Mickey's greatest play is that he's groomed his so-called family-focused son to follow in his footsteps without him even realizing it. And that, my friends, is why Voight is so deserving of today's Primetime Emmy nomination for supporting actor in a drama series. Season two of Ray Donovan premieres this Sunday, July 13th, at 8pm ET/PT so you have only a few days to catch up. Get your binge watch on. Well, that was a disturbing gif! lol. I really hope Showtime puts these newer shows on Netflix Instant soon. There's a few I wouldn't mind checking out.